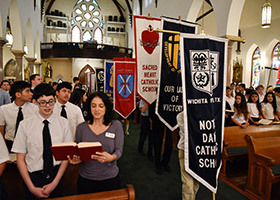 About 420 students from 17 diocesan schools process in during the Eighth-grade Vocations Day and Mass at St. Patrick Cathedral in downtown Fort Worth, Wednesday April 10, 2019. (NTC/Ben Torres) See more photos in the photo gallery. FORT WORTH — For Seminarian Brett Metzler from St. Mark Parish in Denton, his calling to the priesthood began in solitude when he went on a retreat where he spent an hour a day by himself. A simple question from a nun in a convent prompted Sister Marie Therese Nguyen, OP, to consider becoming part of a religious community. Sister Anna Imelda Nguyen, OP, never imagined she would become a religious when she was a young teen, but God changed her heart over the course of several years. The stories were different in their details, but they all led to lives devoted to God. 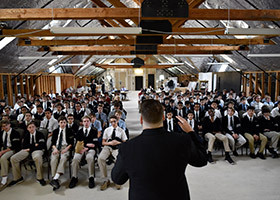 Priests, seminarians, and sisters recently shared how they made their decisions and what they do in daily life as part of Eighth-Grade Vocations Day. 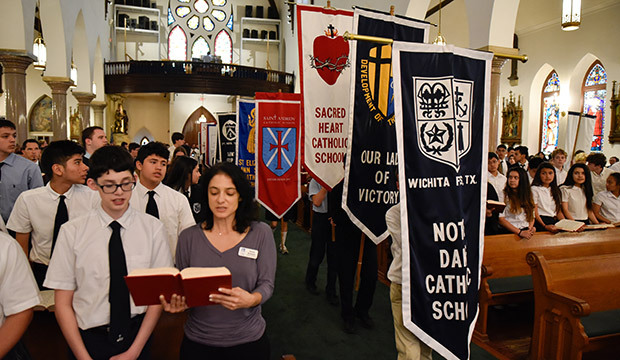 The Diocese of Fort Worth hosted the event April 10 at St. Patrick Cathedral. Some 420 students from 17 parochial schools attended. Students also participated in Mass with Bishop Michael Olson presiding. 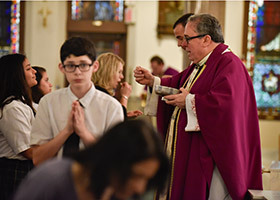 This is the second year the diocese has combined Vocations Day and the special end-of-year Mass for eighth graders. 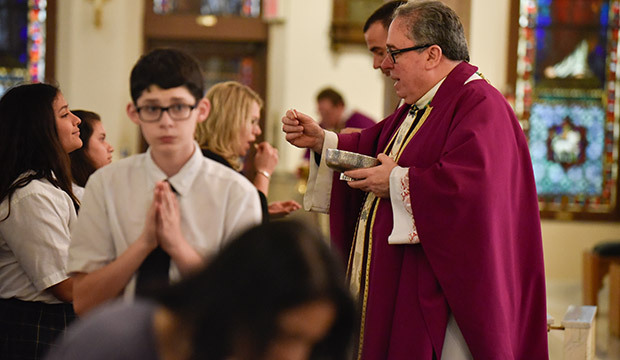 Vocations Day focuses on helping young people think about the possibility of becoming a priest or religious sister, said organizer Melissa Kasmeier, assistant superintendent of Catholic Schools. The boys had a breakout session with Fr. Moon and several seminarians while the girls heard from Sr. Anna Imelda and Sr. Marie Therese, both of whom teach at Nolan. Boys wanted to know how long it took to become a priest (nine years for most) and girls had questions about the nuns’ hair, veil, and habit — like does a habit get uncomfortable in hot weather. The sisters said they were thankful for air conditioning when it was available. Students said they were inspired by the speakers and learned a lot about life for those called to religious vocations. Students paid close attention as they heard about discerning vocations. Sr. Marie Therese began to think about joining a religious community when her family visited a convent in Houston. “One of the sisters asked me, ‘Have you ever considered being a nun?’” she said. She was in the sixth grade at the time, and that question started her on her journey. Metzler began to consider his calling after a high school retreat where he had to spend an hour a day alone. On the third day, he felt a calming presence. Metzler began to spend time every day with God, and his perspective began to shift. “I stopped asking ‘what do I want to do with my life’ and started to ask God, ‘what do you want me to do with my life?’” he said. Boys in the audience said the stories were encouraging. Sr. Anna Imelda had no intentions of becoming a nun when she was a young teen. In fact, she didn’t like the sisters who taught her catechism class because she was held back a year from her first Communion. As a young teen, she liked listening to boy bands like Backstreet Boys and 98 Degrees, watching University of Texas football, and dreaming of marriage. That was the moment she began to seriously explore becoming a nun. Some of the girls said they were surprised to hear that the nuns had some of the same interests they did and didn’t always know they wanted to devote themselves to life as a religious. The speakers encouraged students to keep God first in their lives, no matter what path they take. The teens were taking the message to heart. “I learned God helps people find fulfillment,” said Nick Frazier, a student from St. Elizabeth Ann Seton.